The Family Table with Genevieve: How We Meal Prep!!!!!! Happy Wednesday friends!!! Today I am linking up with Shay & Erika for How We Wednesday. 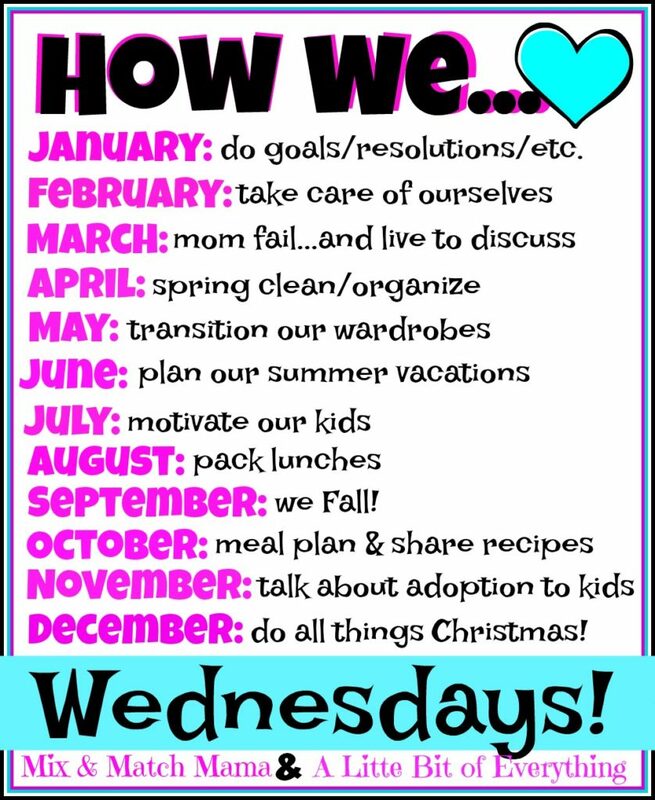 Some fun topics on "how we do" life... and today's topic is how we meal plan and share recipes! I have to tell you this may be my most favorite topic ever. I LOVE to meal prep, grocery shop, cook...ALL OF IT. Now I know I may be alone in this, but something about chopping vegetables totally relaxes me. Crazy, right? Search the recipe tab under my blog and you will see lots of recipes I have shared. Every Monday I try to share a new recipe, usually a meatless option. This week I shared an amazing pasta recipe. Plan a weeks' worth of meals. For me I usually shop somewhere between Friday and Sunday, so I plan my week on a Sunday- Saturday schedule. If you shop on a different day then adjust what works for you. Check out the Meal Plan tab on the home page for weekly meal plans. I shared a meal plan every week last year and you can find them under that tab. I schedule in the meal based on the weeks activities and plan more labor intense meals on days I am off and simpler meals for days I travel for work. Don't think of this menu as "set in stone". If you need to move things around.. that's ok. The goal is to have a plan to use the food you have on hand. Keep these menus...it will help you with future weeks...and I promise, each week will get easier than the last. I have an old school notebook, and just flip the page and start a new week's menu. Then I can look back and get a dinner idea from a few weeks ago if I am stumped! Another tip- hang this menu where the family can see it... it reduces the number of "Whats for dinner?" questions coming at you from everyone walking in the door! Write out your grocery list. For me I like this list to be organized too....I have "buckets" like produce, meat, dry, dairy, etc and list the needed items by category. I used to keep this list on the fridge so I could add things during the week as needed. I have switched it up a bit, and now write my list in my notebook, under my meal plan for the week. Take 30-45 minutes when you get home to prep what you can. I always prep veggies and fruit for easy snacks. I will usually chop any veggies I need for meals that week too. It's not complicated...you just need to take 30 minutes to do it. Be sure to have your kids help out here- they are perfect produce washers.....they can help portion into snack bags... and my kids are at an age where they are more comfortable in helping cutting some veggies too. My kids are pretty eager to help with prep and it is a great chance to talk about healthy choices. They are usually munching on the stuff we are prepping! If your healthier food is prepped it makes it much easier to grab when you're hungry or to pack for lunches. It's much easier to put those peppers in the lunch box when they are chopped and ready. Some staples we always have prepped and ready are peppers, carrots, cucumbers and a fresh fruit (usually melon or pineapple). I have a basket in the fridge with apples, clementines and pears for snacks. When my kid were younger, I tried to keep most of these prepped snacks at their eye level in the fridge. It was known as "their shelf" and it's where they could choose a snack from when they were hungry. I will also tell you that I do one prep on Sunday and then I usually do another quick round while dinner is cooking on Wednesday night. Mostly just some more fruit and veggies for snacks! How about you? Any great meal prep ideas??? Have the best day! See you soon, there is always room for one more at our family table. I'd like to get better at prepping, your idea sounds so doable! The garbage bowl is key, thanks for sharing! These are such great tips! Thank you for sharing. I love the idea of putting the meal plan and grocery list in a notebook. Also, I think I will switch my grocery day to Thursday or Friday so that we are fully stocked for the weekend. I have been going on Monday's. Have a wonderful Wednesday! Such a great idea to have a garbage bowl - I need to try that myself!